The aim of this study was to evaluate the effects of Lady Prelox® for improving sexual function in healthy women presenting with moderate signs of sexual function impairment. The women investigated in this study were aged 37 to 45 years, none having reached menopause and all were of general good health. The Lady Prelox® and placebo-treated groups were comparable at inclusion as judged from the short form of to the Female Sexual Function Index (FSFI) score with 49 women aged (40.4 ± 2.3 years) and 51 women (41.3 ± 2.2 years), respectively. Women were treated for eight weeks with either Lady Prelox® or placebo tablets with identical appearance. In placebo-treated women the FSFI score increased non-significantly from baseline 17.9 ± 2.3 to 23.5 ± 1.8 after four weeks and 23.5 ± 2.2 after trial completion after eight weeks. 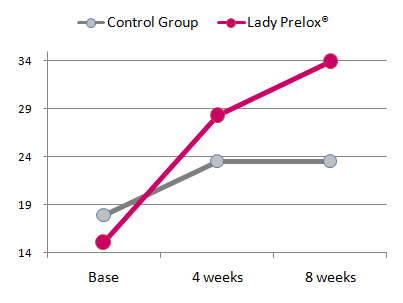 The group of women treated with Lady Prelox® presented with an average baseline FSFI score of 15.0 ± 2.7, which increased to 28.3 ± 2.4 after four weeks treatment and reached 33.9 ± 2.7 after eight weeks. The scores observed in the Lady Prelox® treated group were statistically significant versus baseline values as well as versus the placebo-group at both time points, four and eight weeks, respectively. All domains of the female sexual function score showed improvements with Lady Prelox® of which categories “dryness” and “sexual desire” and “satisfaction”, also related to “sexual satisfaction in the relationship”, were especially noticeable. The intake of Lady Prelox® and corresponding placebo was well tolerated and women did not experience significant side effects attributable to the study tablets. The information presented on this page represents information and conclusions as formulated by researchers and scientists in independent publications reporting on their findings and study results. This information is of a non-commercial nature and is reproduced for information purposes only. It should not be considered as endorsements or accepted health claims for the products concerned.